* Red Filter Maximize your engine's performance with Airaid SynthaMax CAD intake systems! 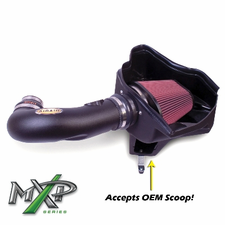 The SynthaMax systems' cold air dam design isolates engine heat away from your intake, keeping the cold air flowing. These intakes feature SynthaMax filters, constructed using the finest 100 percent synthetic materials for unrivaled filtering efficiency. SynthaMax non-oiled filters are washable and reusable. Servicing is easy with oil-free maintenance--simply wash them in a mild household detergent and rinse. That's it! The SynthaMax filters are built with a hand-poured urethane body that won't crack, curl, or shrink like some competitors' filters. Airaid SynthaMax CAD intake systems use the stock air filter location, but add a boost with a huge air inlet that keeps more cold air flowing through the 360 degree filter. These systems maximize your horsepower, torque, and fuel efficiency. They seal directly to the hood and include all parts needed for an easy installation. No one else gives you the bold clean styling of our Aftermarket Dress Ups, Suspension and Performance Parts for your American Muscle Car like UPR Products! Click Here for Instructions Click Here for Dyno Results Fits these Vehicles: 2010 2011 Chevrolet Camaro V6 3.7L. Made in the USA! Maximize your engine's performance with Airaid SynthaMax CAD intake systems! The SynthaMax systems' cold air dam design isolates engine heat away from your intake, keeping the cold air flowing. These intakes feature SynthaMax filters, constructed using the finest 100 percent synthetic materials for unrivaled filtering efficiency. SynthaMax non-oiled filters are washable and reusable. Servicing is easy with oil-free maintenance--simply wash them in a mild household detergent and rinse. That's it! The SynthaMax filters are built with a hand-poured urethane body that won't crack, curl, or shrink like some competitors' filters. Airaid SynthaMax CAD intake systems use the stock air filter location, but add a boost with a huge air inlet that keeps more cold air flowing through the 360 degree filter. These systems maximize your horsepower, torque, and fuel efficiency. They seal directly to the hood and include all parts needed for an easy installation. 2010 2011 Chevrolet Camaro V6 3.7L.